This is the window where all new orders are created. This is the window after an order has been created and you are editing a previously saved new order. Across the top of the window you have a menu that gives you access to various features of this window. The top half of the main part of this window are the order defaults that were set in the customer entry section of RadioTraffic. 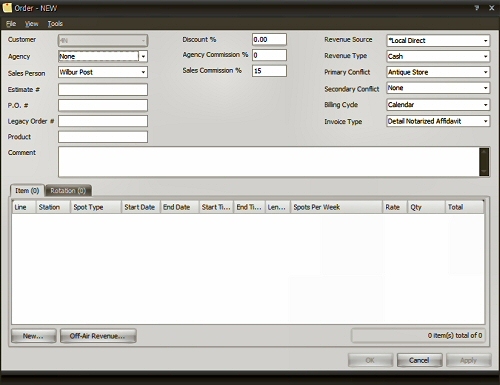 The bottom half of the window contains tabs that show either the line items entered for an order or the copy rotations attached to those line items. Saves the order or changes to the order. This serves the same function as the APPLY button. 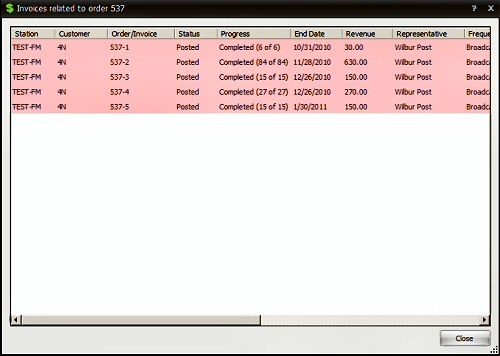 Displays the order confirmation on the screen for review or printing. This closes the orders window. This window displays the placement of the spots within the order on logs after the logs for the days of the order have been created. The FILE menu on the placement summary offers the print, print preview and close options. 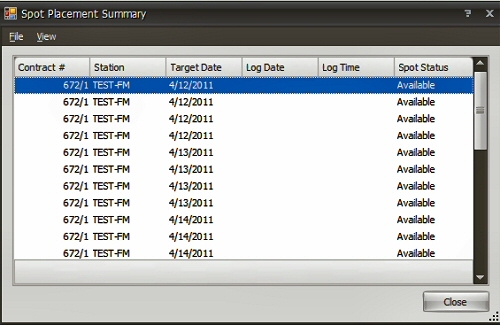 The VIEW menu allows you to reset the layout of the screen to Contract #, station, target date, log date, log time and spot status. This window displays the invoices related to the order viewed. This window is not MyViews enabled. This window displays all actions taken upon the chosen order. This window is not MyViews enabled. On this screen you can see: Activity, Comment, Date and User. Approves all lines on the order. Stops all lines in an order as of a date chosen by the user. This needs to be chosen before you can make available changes to any order previously entered into the system. This section of the manual will give you step by step instructions on adding a new order to the system. Confirm that all the items in the order header are correct. The items should be set to the default settings in the customer screen. If any of these settings does not line up with what you need for this individual order, you can change it. 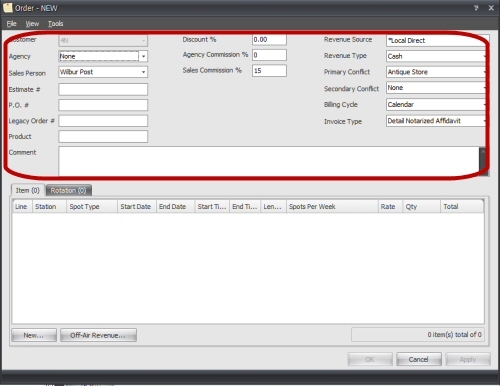 While most of the options available should have been previously set with the customer screen, there are some items that can be added or edited from this screen. Those items are: Agency, Revenue Source, Revenue Type, Primary & Secondary conflict. Just right click on those words (as you would in the customer screen) to add new or open an existing data entry. Make sure that the order includes a Primary Conflict. <priormonth> - The name of the month for the invoice end date minus one month. 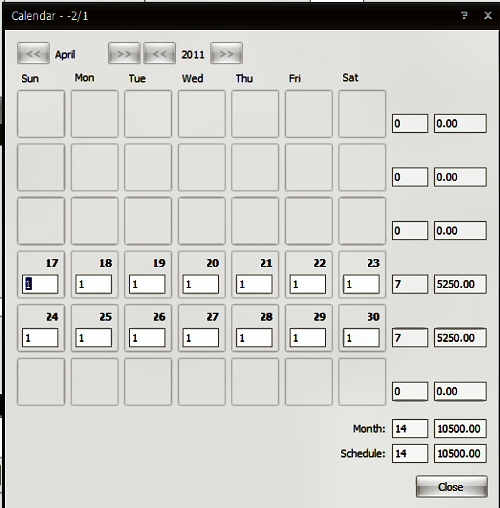 <month> - The name of the month for the invoice end date. <nextmonth> - The name of the month for the invoice end date plus one month. NOTE: The initial opening of an order is a good time for stations that give one time bonuses for new orders or special bonuses for certain packages to make the change to the salesperson's commission rate. 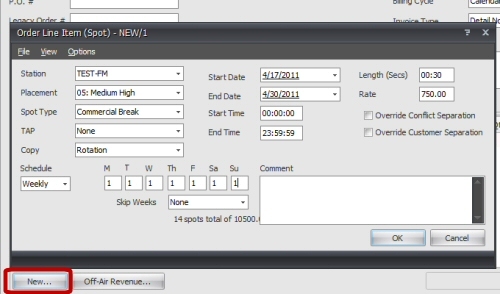 The rate shown will be the default rate set for the salesperson in their user account. Choose the station where the off air revenue will be charged. Date the order is to begin. Last date of the order. This may be the actual end date of the order itself or the end of the time period for the billing if using weekly or monthly billing. Amount billed for each item. A comment that will print on the invoice. 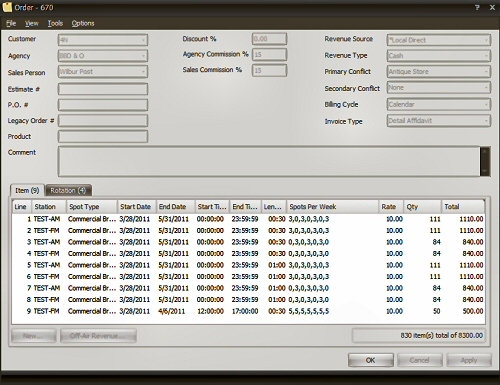 This could let the client know what is billed with this off air revenue item..
Add line items that contain spots. Click the button at the bottom of the screen that says NEW to add a new line item. This tells RadioTraffic where to place the spot in relation to other spots to be scheduled that day. By default, this setting will be at 5. If you do not wish to "weight" the orders to place certain spots before others, just leave all orders at this default. If you want a spot to place before others, use a lower number with 1 being the highest priority. If it's a spot that can be pre-empted (like a fill spot) then make the number higher with 10 the lowest priority. This is the category in your format where the spot will be placed automatically by RadioTraffic. Choose your Total Audience Plan. Choose the piece of copy that applies to this line or choose "rotation" to choose all spots in the rotation. Last date of the order. Time of day the order is to begin placing spots. By default, that will be midnight. Time of the day order is stop placing spots. By default, this will be just before midnight. Tells RadioTraffic to ignore conflict codes when placing these spots. Tells RadioTraffic to ignore customer separation when placing these spots. Both "Override conflict separation" and "Override customer separation" are useful when placing an order for commercials where the product is not the paying customer; i.e. a business paying for spots to promote a local Relay For Life or other charity event. SPW, or Spots Per Week, is the lowest priority placement for RadioTraffic. Spots placed using this method can be placed on any day within the week based on days that you choose. This means that these spots can be bumped to other days if Daily and Weekly spots will fill up a day's log. Unless you're open to having all the spots for the week from a client running on the same day, we recommend you use a Daily or Weekly spot option. If you have differing amounts of spots running on certain weekdays, you want to use a daily schedule. (Also known as calendar.) Click the calendar button to get the calendar entry window. EVEN IF YOU HAVE THESE SPW WEEKS WITH A HIGH PRIORITY CODE, THEY CAN STILL BE BUMPED BY LOWER PRIORITY SPOTS PLACED WITH DAILY OR WEEKLY PLACEMENT. The final step is to attach copy to your order. Click the ROTATION tab to open the copy placement window and enter your copy. If your station sells advertising packages that are billed with a flat rate each month regardless of the number of spots that run or as part of a certain number of spots for a monthly rate, you will need to use the OAR lines to set up the flat rates for billing. Set up and develop the order as shown above but in each of the lines for the spots, use a spot rate of 0. I entered something incorrectly so I want to fix it and I'm unable to. I put a stop to it and tried to go in and edit it and can't, so I'm just wondering what I'm missing? If the order has not been approved, right click on the order you wish to edit and choose open. Make any changes. If the order has been approved, open the order and choose "Options". Left click to select "Correction Mode." Make any necessary changes and click "Apply" or "OK" to save the changes. If the order is currently running, you can only make a few changes via the Correction Mode option. 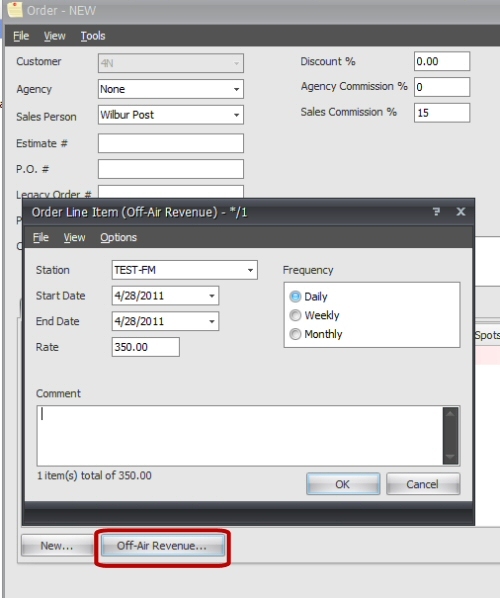 You can change most of the header items although those changes will not be retroactive for already finalized invoices. To edit a currently running line item, enter correction mode. You can change some items in the line item: priority, spot type, copy and rate. If you need anything else changed, you will need to stop and duplicate the order. For complete details on how to change an order that is already approved, refer to this How To. To learn about adding your rotations to an order, click here.